The kidneys are bean-shaped organs. Each is about 4 to 5 inches (12 centimeters) long and weighs about one third of a pound (150 grams). One lies on each side of the spinal column, just behind the abdominal cavity, which contains the digestive organs. Each kidney receives blood through a branch of the aorta, called the renal artery. Blood flows from the renal artery into progressively smaller arteries, the smallest being the arterioles. From the arterioles, blood flows into glomeruli, which are tufts of microscopic blood vessels called capillaries. Blood exits each glomerulus through an arteriole that connects to a small vein. The small veins join to form a single large renal vein, which carries blood away from each kidney. There are several different birth defects that affect the kidneys (the two organs that filter waste from the blood to make urine). These defects are not usually apparent at the doctor's examination and require tests to evaluate the urinary tract. Blockage of urine flow can cause urine to become stagnant and result in urinary tract infections (UTIs) or formation of kidney stones. 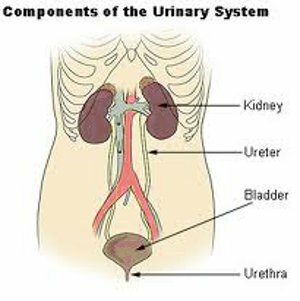 Blockage of urine flow also can raise the pressure inside the kidneys and damage them over time. Kidney damage can cause high blood pressure and, rarely,kidney failure. 1... In our body three parts 1. Brain 2. Heart and 3.. Kidneys are very important for Healthy life. 2... Kidneys filter 3 liters of blood per hour and toxic materials along with waste water sent to bladder. 3... When bladder fills with two cups it remove from our body as urine.